The Uffizi Palace was constructed in the mid- sixteenth century by the architect Giorgio Vasari (1511-1574) in the period when Cosimo de' Medici, first Grand Duke of Tuscany, was bureaucratically consolidating his recent takeover of power. Built in the form of a horse shoe extending from Piazza Signoria to the River Arno and linked with Palazzo Vecchio by a bridge over the street, the Uffizi were intended to house the offices of the magistrature (Uffizi = offices). From the beginning however, the Medici set aside certain rooms on the third floor to house the finest works from their collections; two centuries later, in 1737, thanks to the far-seeing generosity of the last heir of the family, Anna Maria Luisa, their collection became permanent public property. The Gallery now consists of forty-five rooms where the paintings are arranged in chronological order from the thirteenth to the eighteenth centuries. Among them are some of the most famous and representative paintings of Italian, and in particular Tuscan, art, but there are also important sections devoted to Flemish, French, Dutch and German painters. Apart from its paintings, the Uffizi exhibits ancient Roman sculpture and sixteenth century sculpture; these are all seen in the three corridors whose ceilings are frescoed with grotesques. On the ground floor the remains of the old Romanesque church of S. Pier Scheraggio partly destroyed by Vasari to build the Uffizi, have been recently restored; the frescoes of ''Famous Men'' by Andrea del Castagno (1421-c. 1457) are exhibited here. On the second floor is the Prints and Drawings Department, housing a very rich collection begun by Cardinal Leopoldo de' Medici (17th century). Occasional public exhibitions in the adjoining room show selections from this collection. 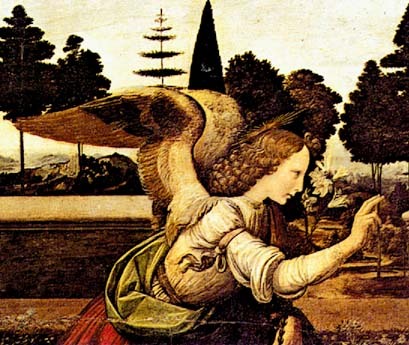 The Uffizi is the most important and most visited museum of Florence. Following their natural layout, we find in the first of the rooms the great altarpieces of Cimabue and Giotto, humanized images of God and the earliest examples of the new art of the Renaissance. 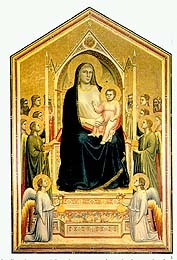 After these comes the Sienese elegance of Duccio, Simone Martini and Lorenzetti, together with the robust school of Giotto (13th-15th centuries; Rooms 3 & 4). Then follows the International Gothic Style; two examples of the Adoration of the Magi by Gentile da Fabriano and Lorenzo Monaco (early 15th century; Rooms 5 & 6). The Uffizi's best-known rooms are dedicated to Florentine painting on the eve of the Renaissance (15th century); in Room 7 we find works by Masaccio, Paolo Uccello, Domenico Veneziano, Fra' Angelico and Piero della Francesca. Then follow the elegant Madonnas of Filippo Lippi, Pollaiolo's delightful little panels, and finally, in the newly-restored main room the mythological allegories and religious paintings of Botticelli. 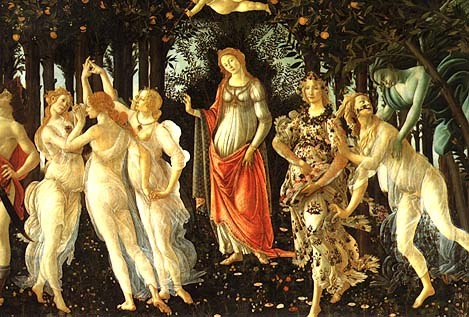 This unique group includes the Birth of Venus, the Primavera, the Madonnas "of the Magnificat" and "of the Pomegranate". Passing to Leonardo da Vinci and Verrocchio (Room 15) we find the Baptism of Christ by both masters, and the Adoration of the Magi by Leonardo alone. The following rooms (16-23) are the oldest, in the gallery and the Tribuna deserves a special visit as the former setting for the most precious works of art in the collection. After this is a series of rooms used by the Medici as armouries and now containing more Renaissance works by Bellini, Giorgione, Perugino, Signorelli and the German and Flemish schools including Durer, Cranach, Memmling and David (15th - 16th centuries). After the Miniature Room and the Second Corridor with its splendid view of the Arno, Room 25 opens the series of rooms devoted to sixteenth century painting. 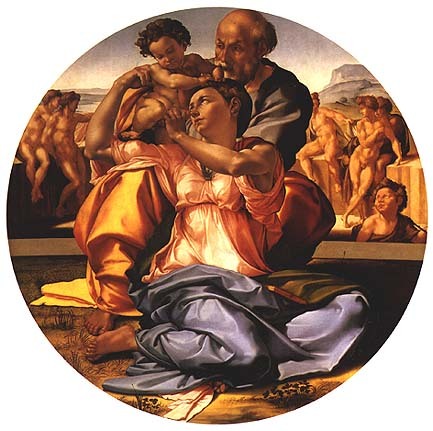 With the Holy Family (" The Doni Tondo ") by Michelangelo are found the works of Raphael (Madonna of the Goldfinch) and Titian (Venus of Urbino, Flora). 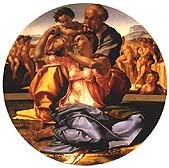 The section of Mannerist paintings is particularly rich, ranging from Pontormo to Rosso Fiorentino, Bronzino and Parmigianino (Madonna with the Long Neck). 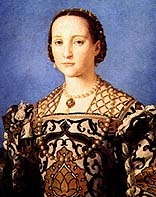 Venetian art of the period is well represented by Sebastiano del Piombo, Veronese and the room dedicated to Tintoretto. Barocci of Urbin also has a special room, where his Madonna of the People is shown, and El Greco is represented by Two Saints, acquired recently. Room 41 contains the works of Rubens, (1577-1640). The Uffizi owns the robust but affectionate portrait of the artist's wife and the two huge canvases with the Triumphs of Henry IV of France. The seventeenth century is well represented by Caravaggio (Young Bacchus, Abraham and Isaac), Annibale Carracci (Baccante), and Claude Lorrain (Seaport with Villa Medici) followed by an exceptional collection of Dutch and Flemish subject pictures and genre (Room 44). The 18th century Niobe Room with its white and gold plasterwork contains the marble group of Niobe and her Children for which it was specially constructed. Italian and French eighteenth century paintings are preserved in the Gallery's last room and include Tiepolo, Guardi, Nattier, Chardin and Goya, all representing the finest art of the late eighteenth century and the early nineteenth. The visitor to the Uffizi may also visit the famous Vasari corridor linking the Uffizi and Pitti Palaces accross the Ponte Vecchio. Apart from the delightful views of the city through the corridor's circular windows, its entire length contains around 700 works, some of the 17th and 18th centuries in addition to the celebrated and unique self-portrait collection. (A visit to the corridor may be booked in advance through the Museum secretary). � Uffizi Gallery Tickets Reservation New! � Uffizi Gallery Tours Reservation New! � Florence Museum Tickets Reservation New!